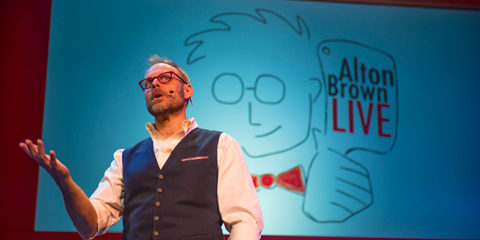 Join Alton Brown for a fun and enlightening evening at his Alton Brown Live! The Edible Inevitable Tour.. The Food Network star has big plans for his two hour show: a multimedia lecture, a soupcon of comedy, food experimentation and, for the first time, live music. If called upon to be Alton’s culinary assistant, it is highly advisable to accept the lab coat offered as things can get a little messy! Mr. Brown has been entertaining the masses for over a decade, but this is the first time he has taken his show on tour. This is a family friendly show and to add to the entertainment, there is what is known as the Poncho Zone. Let’s just say it involves select seats in the first few rows, plastic ponchos and lots of laughs..!